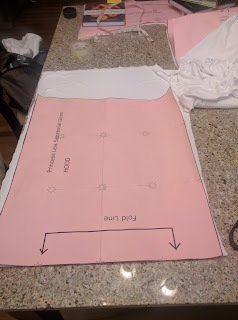 Before I put pattern to fabric and cut I realized I needed to double check all the details! I ordered six yards of this White Polyester Jersey Knit. Of course I didn't measure my pattern to make sure that was enough. Sometimes I like to live dangerously! I ordered a yard of White Knitback Vinyl. It seems very similar to the silver vinyl I used for my Ceremonial Leia belt. My current plan is to cover a pair of my old boots using this amazing tutorial, so I ordered 2 yards of Galaxy White Fleece Back Vinyl Fabric. Where to start? The the Rebel Legion standards! There's also a wonderful list of resources here. Then, on to P&S Costume Creations amazing tutorial and pattern diagram. Using that as a guide, I drafted my Senatorial Gown pattern in Inkscape. I LOVE Kay Dee Collection's work, and her Senatorial Gown page is no exception. She also has links to belt patterns and hair tutorials. The gown is fully lined with the same fabric as the outside. I'm planning to make two sets of the dress, then sew the bottom hems and the sleeve hems together. Hopefully, I'll also sew the keyhole back together. That should enable me to turn it right side out in the raw neck edge. I haven't yet decided if I'm going to serge it or use my walking foot and stretch stitch. I'm leaning towards the walking foot and stretch stitch, as that gives me the best result on finicky knits. Just need to remember to put a ball point needle in my machine! I'm the WORST about changing needles when I'm working on projects for myself. With commissions, I change the needle if I so much as look at it funny. But I get lazy for some reason for many fabrics when I'm sewing for myself. The hood is a rectangle (well, trapezoid), with the short edges gathered into the neckline. The long edges for the front of the hood, and the open back. A rolled hem is hand-stitched. The Construction Details and Tips on the Padawan's guide has awesome details. This part also has details smocking being used at the waist, which is what I think I'll do, rather than gather! The keyhole opening in the back will need to go down far enough that I can get my head through. Okay. So I caved. I'm ordering these boots, which should work once I remove the straps.